There was no shortage of supercar reveals at the 2019 Geneva Motor Show, with new model debuts such as the Bugatti La Voiture Noire, the Ferrari F8 Tributo, and the Aston Martin AM-RB 003 Concept all vying for your attention. One of the fastest new models at the show, however, was the jaw-droppingKoenigsegg Jesko. Set to replace the record-breaking Agera RS, the Jesko is powered by a new twin-turbo V8 engine that produces 1,280 hp on regular gasoline and 1,600 hp on E85 fuel in certain markets. This makes it most powerful internal combustion engine ever fitted to a homologated production car, which should enable Koenigsegg to finally break the 300-mph barrier. 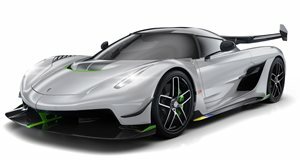 But despite costing around $3 million, Koenigsegg has had no trouble finding buyers for its latest hypercar, because the Jesko has already sold out just two weeks after its world debut. In total, 125 examples of the Jesko will go into production. According to Koenigsegg, 83 cars were sold before the show, with the remaining examples selling within five days of the car’s debut at Geneva. A small number were also bought by dealers to secure build slots for potential clients who couldn’t attend the Geneva show. "The new Koenigsegg Jesko is the highest volume production run we’ve ever planned. For it to have sold out within days of its unveiling is both humbling and a wonderful testament to the outstanding crew we have at Koenigsegg,” said Koenigsegg Founder and CEO, Christian von Koenigsegg. "From the visionary work of our designers, engineers and technicians to the incredible job done by our sales team and our global network of Koenigsegg dealers – it took a great team to bring the Jesko to the world. We are very thankful for the reception it’s received from the press, the public and of course, our growing family of Koenigsegg owners." The Jesko can be specified in either track or top speed variants according to customer preference and each car will be homologated for road use. Production of the Jesko will begin at the end of 2020 at a rate of one per week.